Establish an efficient sign lighting system with the 12" Emblem Shade Gooseneck Light. This outdoor-rated fixture features a solid aluminum construction and rust resistant powder coated finishing. 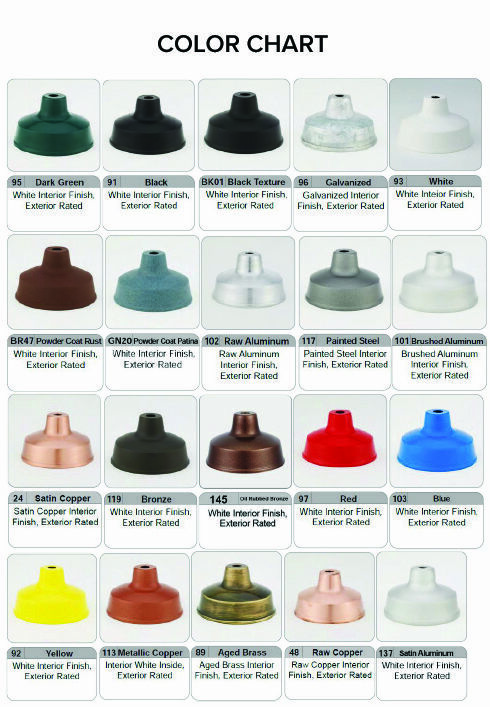 Choose from 25 attractive color options; white, black, galvanized metal and dark green at no additional cost. The Emblem Shade has a modern look and one fixture can illuminate 3-4 feet of signage. Standard incandescent gooseneck lights are rated for bulbs up to 200W and give off a warm, brilliant glow. For upgraded compact fluorescent, LED or high-intensity discharge (MH and HPS) gooseneck lighting, please call toll free for a custom price quote. Aluminum gooseneck lights with incandescent lamping are easy to install to most 4"D standard junction box. Back plates, gooseneck arms and Emblem Shades are all powder coated to match, except for the inside of shades which are left white. For an adjustable sign light, ask us about adding swivel couplings.